Made with milk from their own herd and wrapped in cloth that is traditionally sealed with lard it has a lovely firm, dense texture that feels rich and buttery with a savoury tang that becomes more grassy and mellow on the finish. Excellent example of a traditional cheddar. Click here to buy Denhay Cheddar! Winner of the same award in 2010 it is a small, handsome, compact cylinder with a sticky whitish rind dusted with ash creating a stark contrast with the pure white soft melt in the mouth, mousse-like interior. Fresh with a lemony zing and subtle herbaceous tang overlaid with a wonderful nutty goaty taste. Buy Dorstone here! There were 112 cheeses in this category… so to win it with a mild cheddar makes this an even more impressive win. Made to a 16th Century recipe on Quickes 450 year old family farm, near Exeter, it has a firm body and a wonderful subtle but distinct taste with a buttery feel and fruity and nutty notes. The only traditional cheddar maker in Devon. 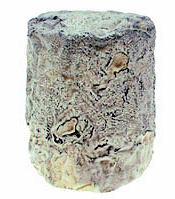 Large, square, raw ewes’ milk cheese with distinctive ridges, rounded corners and a rustic reddish-brown rind dusted with a multitude of brown, grey and charcoal moulds. Inside it is dense, compact and slightly oily with a superb burnt caramel, sweetness from the milk that hints of roast lamb and crushed nuts.